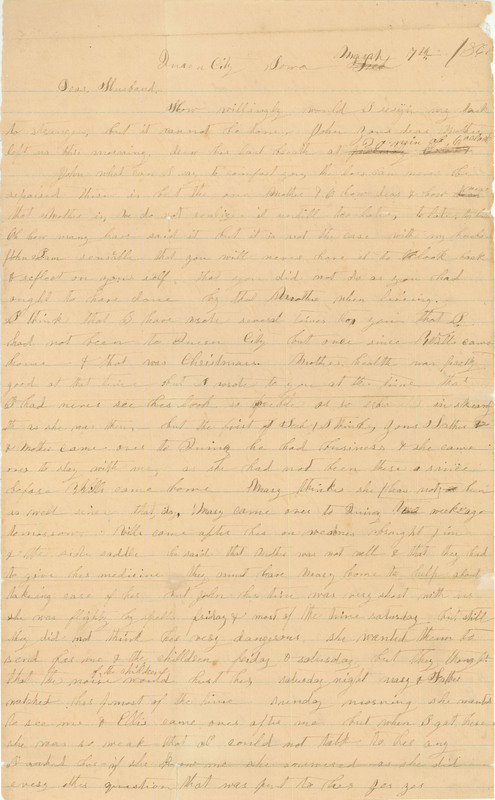 Queen City Iowa March 7th 1865 Dear Husband, How willingly would I resign my task to strangers, but it cannot be done, John your dear mother left us this morning, drew her last breath at 30 min af. 6 o'clock. John, what can I say to comfort you? the loss can never be repaired, there is but the one Mother & how dear & how near that Mother is, we do not realize it untill to late, to late, to late. Oh, how many have said it but it is not the case with my husband, John. I am senseable that you will never have it to look back & reflect on your self that you did not do as you had ought to have done by that Mother when liveing. I think that I have wrote several times to you that I had not been to Queen City but once since Wills came home & that was Christmas. Mother's health was farely good at that time but I wrote to you at the time that I had never see[n] her look so feeble or so exhausted in strength as she was then, but the first of [Feb.] I think, your Father & Mother came over to Quincy. he had business & she came over to stay with me, as she had not been there since before Wills came home. Mary thinks she has not been as well since that day. Mary came over to Quincy two weeks ago tomorrow. Wills came after her on wednes. brought in the side saddle, he said that Mother was not well & that they had to give her medicine. They must have Mary home to help about takeing care of her, but John, her time was very short with us. she was flighty by spells friday & most of the time Saturday, but still they did not think her very dangerous, she wanted them to send for me & the children friday & Saturday, but they thought that the noise of the children would hurt her. Saturday night Mary & Father watched her most of the time. Sunday morning she wanted to see me & Ellis came over after me but when I got there she was so weak that I could not talk to her any. I asked her if she knew me. she answered as she did every other question that was put to her: yes, yes.